Question in the title. I paid for Uzi, MP5, CZ 75, beretta, desert eagle, Sig 550.. can I recover my old models ? We are working on it now..
We just have finished the functionality, and now you can recover models from Gun Disassembly 1 (which was supported only for iOS). I'm sorry, but, it mean that I can't use this instruction to have my old models in my PC ? ludovski wrote: I'm sorry, but, it mean that I can't use this instruction to have my old models in my PC ? I'll try to describe mechanic. All your iOS (iPhone/iPod/iPad) purchases are stored in the database. Identification by device UDID (unique identifier). 1. Login into your Gun Disassembly 2 account on the noble-empire.com site. If you have no account -- create new one. 2. Go to the your profile (link in the top right corner of the site after you register). You'll see your account private information. 3. Press "Import iOS Purchases" button. You have to paste your iPhone (iPod or iPad) UDID. If you don't know how to do it -- there are link to page with complete instructions, it's quite simple. 4. Paste your UDID and press "Import Purchases" button. 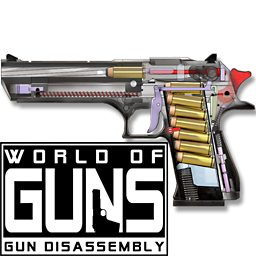 If everything ok -- all purchased will be saved into Gun Disassembly 2 database. Only thing you need to do -- open Settings in the program, verify your email and press Ok.
5. If something goes wrong -- don't hesitate to contact us. We'll fix it or unlock your old purchases manually. Sorry, it was server problems. Just fixed. Please try again. Thanks. "iOS device UDID not found. Please contact support." Someone have the same problem ?